Small concerts are often held for patients and visitors at the “Piano Lounge” located in the basement of Geonguk University Hospital in Hwayang-dong, Gwangjin-gu, Seoul. It is located in the middle of the building, and it can be seen even from stairs and hallways of the 1st and 2nd floors, and people can rest in a comfortable atmosphere as they see the sky through the glass roof. On August 30, Monday, when the heat of summer was still severe, a special event was held at this place and attracted people’s attention. 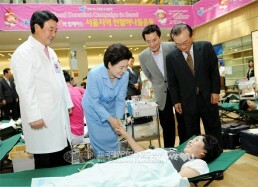 This day, a blood drive, which had been held by the Intl. 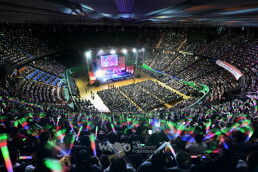 WeLoveU Foundation since 2004 in main cities, was also held by Seoul branch. This was held to provide healthy blood to emergency patients who need blood because of injuries from accidents or intractable diseases, and also to people who have financial problems. Another reason the event was held was to raise people’s interest in donating blood. Geonguk University Hospital (Head Baek Nam-seon) and Seoul East Blood Center of Korea Red Cross (Head Seo Joon-seok) supported the Intl. WeLoveU Foundation by providing the place and a medical team of about 30 members. The medical team members of Seoul East Blood Center help the donors with collecting blood. The WeLoveU members and a guardian of a patient give their blood donation certificates. At the lounge, 22 beds were set for the donors, and two blood donation buses were placed outside the emergency rooms on the first floor, so a total of 30 beds were provided. As so many members arrived from early in the morning, the blood drive began before 10 a.m., which was the time when the event was supposed to begin. 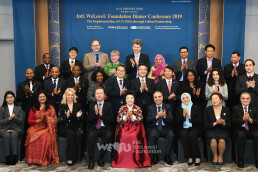 The directors including Chairwoman Zahng Gil-jah, Sponsor Chairman Lee Sun-jae, PR Ambassador Kim Seong-hwan and Chief Director Lee Gang-min of the Intl. WeLoveU Foundation visited the event place at about 2 p.m. and encouraged the donors. 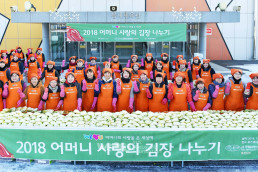 As the WeLoveU Chairwoman encourages the members, holding their hands with the words of blessing, they all smiled just like children who are complimented by their mothers for doing a good thing. The blood drive by Seoul branch was held in an open place to inform citizens of the importance of blood donation so that more people will join it. It was planned to end at 4 p.m., but due to positive response of the Foundation members and citizens, it ended after 5 o’clock. Even the hospital staff participated in the blood donation, and some guardians of patients and visitors asked questions about the event. A middle-aged woman gave two sheets of blood donation certificates that were left to her after the surgery of her daughter who is a university student. She said that she barely persuaded her daughter, who had been hospitalized for months because of blood poisoning, not to donate her blood. And a woman ran to the checkup room with her child to donate her blood because her child kept asking her to do it too. Like this, we saw many touching moments that day.